Happy Halloween from Spider Lily and her babies and of course all of us at Nook Flowers! He was travelling for work and he sent her this to say that he'll be missing her. 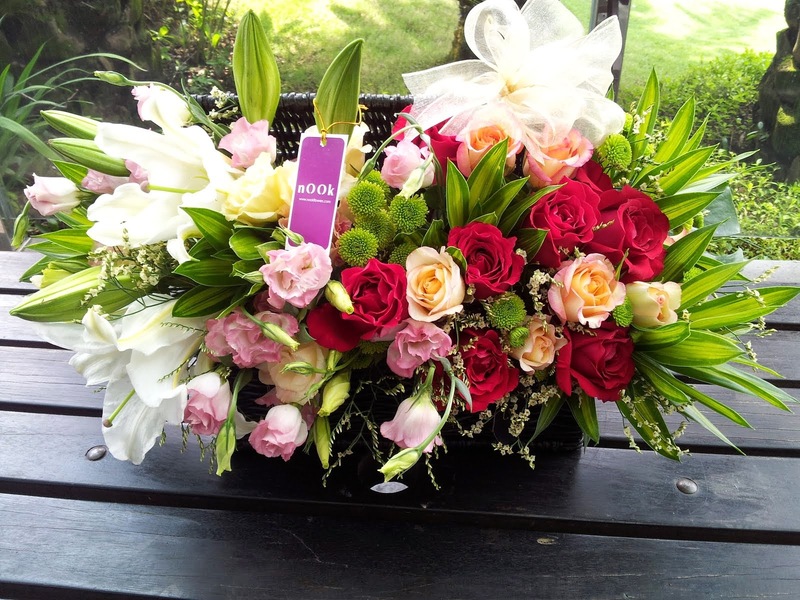 The arrangement features cymbidium orchids sitting delicately amidst eustomas, spider mums and dainty alstromerias. From one thoughtful friend to another to uplift the spirit during trying times. Everyone should have friends like this! 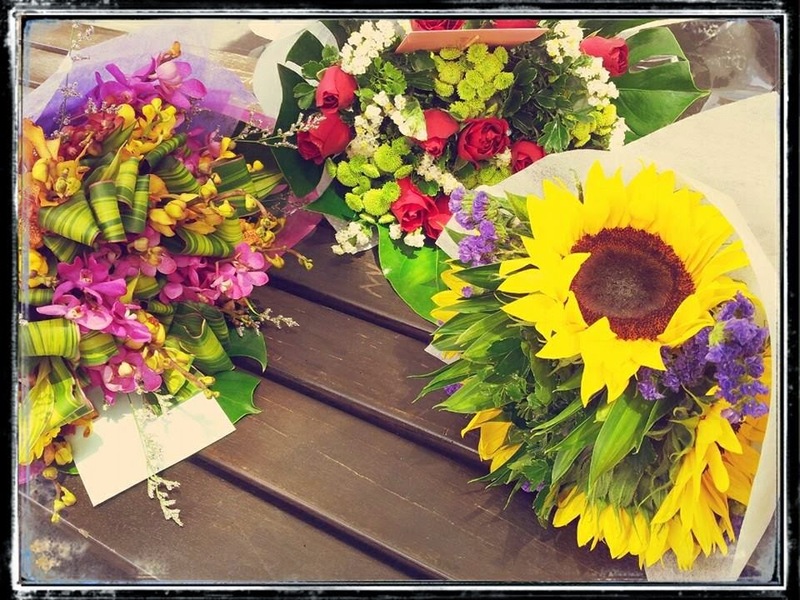 One lucky birthday girl received all of these bouquets from the man who says he's the lucky one to have found her. Selamat Hari Raya Aidil Adha to all our Muslim friends and customers. A restful day off to everyone else. Be safe on the roads when travelling. Something bright and cheerful for an overcast Saturday morning. Sunflowers always do the trick! Here's wishing everyone a happy and restful weekend. This one of a kind free-form willow basket is bursting with pink-hued blooms. Commissioned by a niece for her much loved aunt, we used roses, eustomas, cymbidium orchids, alstromeria and sweet williams with trailing ivy. Sometime last year, the team at a local lowcost airline wanted to say 'Welcome on Board" to their new CEO, so we created this whopper with hydrangeas, lilies, daisies, carnation sprays and curly willow. Look closely and you'll see that the butterflies are carrying small bunches of hydrangeas too! Is it just me or does anyone else have a hankering for a chilled glass of something pink and bubbly now? Our much favoured wild flower composition continues in this gold basket with pearl accents overflowing with lilies, alstromeria, buttons, caspia and eucalyptus. Love the way our friend SE commented,"I think this is my fav. No staid uniformity in the arrangement but all coming together seemingly so effortlessly. Really feel the beauty of the earth." Inspired by Gershwin's 'Rhapsody in Blue' we created this multi-hued basket of lilies, roses, orchids, eustomas, caspia and cordyline with fresh burst of green from Song of India and rain forest leaves. If you are as curious as we were in trying to figure out the exact shades of purple in this basket, click on this link to Shades of Purple and delightfully discover almost every shade of purple one could imagine. Labels: arrangements, Baskets, Did you know? CCM Berhad recently had it 50th Anniversary Gala DInner celebrations at the Putrajaya International Convention Centre and we were invited to create some chic floral displays for the occasion. The event was brilliantly managed by the creative and super efficient team from Inspired Events (thanks guys for making this project a breeze to manage despite the road blocks!). More of Inspired Events projects can be viewed at www.ievents.biz.